The mornings are less complicated these days which makes fishing a natural recreation. 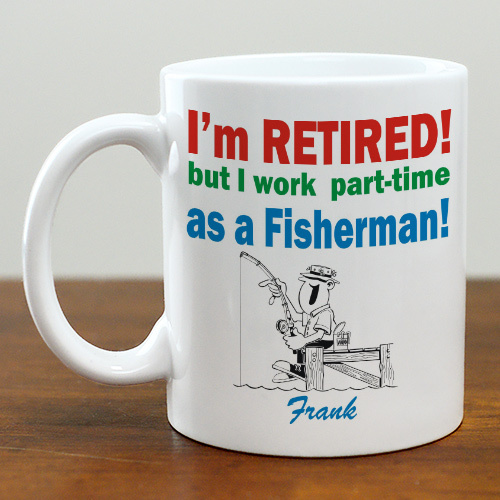 Give your favorite recently retired, part-time fisherman one of these unique Fisherman Customizable Coffee Mugs. Our Personalized Mugs are Dishwasher safe and holds 11 oz. Includes FREE Personalization! Personalize your Fisherman Coffee Mug with any name. GiftsForYouNow.com also carries additional Personalized Fishing Coffee Mugs. Shop GiftsForYouNow.com for all your Birthday Gifts & Father's Day Gifts.